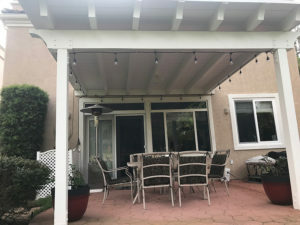 Lattice patio covers have been a popular addition to many backyards in Ventura County, offering an extension to the interior living space. The near-perfect Southern California weather makes a lattice patio cover perfect because it provides partial shade, while still allowing the sunshine to peer through. But what about those days when it’s too warm outside, or maybe it’s raining or windy? The good news is there’s a way to convert your existing lattice patio cover to a solid roof deck using most of the existing materials. When it’s done, you will enjoy a comfortable space outdoors, rain or shine. Spacing of the rafters – Ideally you have 4 in. x 6 in. rafters with 24 in. spacing. Distance that the rafters run between the ledger and the beam – The closer the distance between the ledger and beams, and the greater the size of the rafters, the better. Size of the beam and posts – If these are too small, it cannot adequately support the weight of the new roof. Positive slope for runoff – Check to make sure your patio cover has a positive slope away from the house to properly drain when it rains. Now, assuming you have the right specifications, we recommend removing the existing lattice and installing either 2 in. x 6 in., tongue and groove or T 1-11 siding. They both have similar looks from below (grooves that run left to right) with the difference being that the T 1-11 siding comes in a 4 ft. x 8 ft. sheet and is less expensive. Once the lattice is removed and the solid roof deck is installed (T 1-11 or tongue and groove) the roof system is ready to be installed. We recommend a Flintlastic® Self-Adhered Cap Sheet Roof manufactured by CertainTeed. This system is fully adhered and does not require a torch to install. The cap sheet also comes in different colors other than the standard “commercial white”. Most homeowners in Camarillo, Thousand Oaks, Simi Valley and Moorpark often select the CertainTeed Resawn Shake or Weatheredwood shingle colors for their new patio roof. The last key detail is the flashing–where the roof intersects with the outer-wall of your home. We recommend either a tucker flashing or you can choose to cut into the stucco and install a counter flashing. Another option, although more expensive, is to “break out” the stucco and install a z-bar counter flashing. While this is the best overall option, it isn’t necessary and can add significant cost and you’ll probably need to involve a professional contractor to do this correctly. Once your new patio cover is complete, there are a few additions or enhancements you may want to consider, including a skylight, ceiling fan, lights or even a TV. Skylights are simple and straightforward to install, as long as the width lines up nicely with the spacing of the rafters. 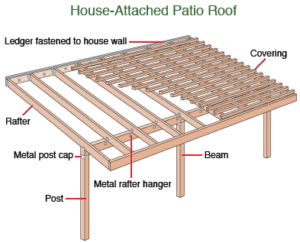 The electrical for a ceiling fan or lighting can be run on top of the new patio roof deck. Note: Make sure to check with your local building and safety department for specific code requirements. Converting a lattice patio cover to a solid patio cover can be a very cost-effective way to enhance your outdoor experience, extend your living space, and add appeal to your backyard. If you’re not ready to take this project on yourself, give GreatWay Roofing a call for a free estimate at 805.523.2550.